Thursday September 21st, 2017 by Andrea G. C.
Igor Skaletsky (Voronezh, 1978) is a Russian digital artist who works within a neo-surrealist aesthetic. Moving to Israel in 1990 and obtaining his Bachelor’s degree in painting from the Surikov Institute of Art in 2008, Skaletsky has exposed in numerous European cities, including Tel Aviv in the Middle East. His work is mainly considered to be pop surrealism with a kitsch aesthetic. Skaletsky’s collages are characterized by the mish-mash of works of art in its broadest of senses, his iconography being the result of the reinterpretation of elements extracted from other paintings throughout the history of art. Through digital collages, he is able to perfectly adapt the themes of past artwork in new pieces, often using both male and female models as the axes of his composition. These are anonymous men and women, which is why they don’t condition the spectator in any way and the artist can provide them with whatever meaning he wishes. Due to the strong connection between Skaletsky’s art and current pop culture, his creations normally address contemporary topics and use 20th and 21st century characters, reminiscing, often in a mocking and critical spirit, a textbook contemporaneity. 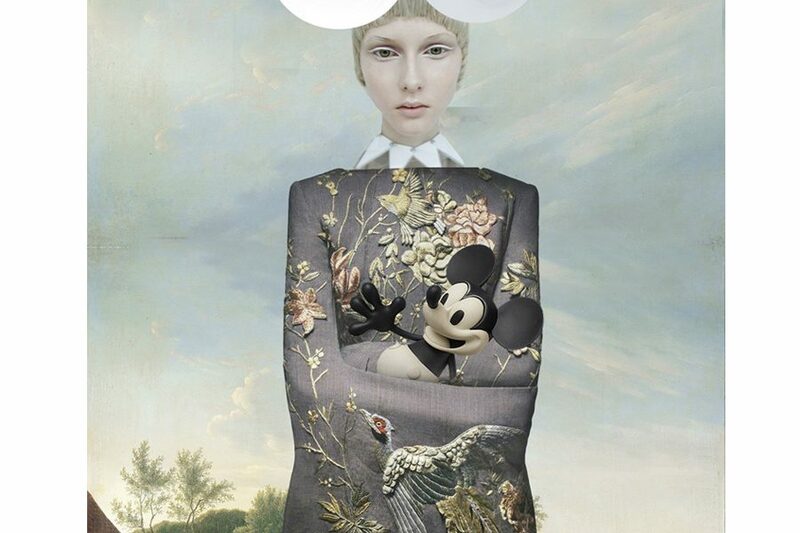 Mickey Mouse is one of the characters in his work, for instance.The iconic Disney protagonist, so frequently exploited in pop art representations, poses in the arms of a young woman with two plates on her head, that not only simulate the model’s “hair”, but also the mouse’s silhouette. 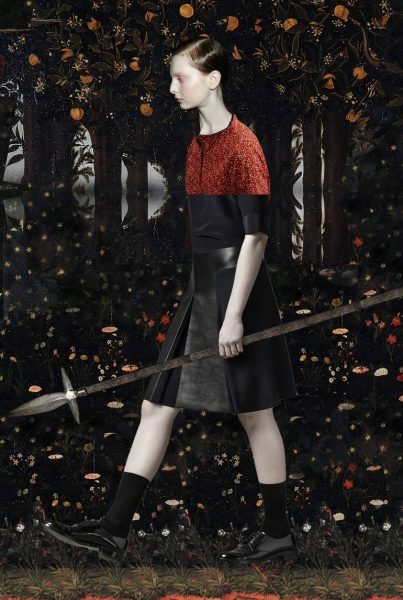 The model is wearing an Oriental style dress by designer Alexander McQueen and the background is Hilly Landscape, a painting by Dutch painter Gerrit Jan Michaëlis. It is a very beautiful and balanced composition in which cold, neutral colors dominate, as well as the clarity the lighting provides. Here, Skaletsky’s ironic or denouncing quality is not as evident as in other works, Mickey Mouse being what links the piece with present time. For this reason, the woman in the painting, whose dress is clearly from Eastern Asia, is carrying the animated character. This alludes to the phenomenon of cultural globalization, because the character can be recognized everywhere in the world. Pop surrealism is the artist’s means of transmitting some of the most controversial subjects of pop culture: politics. His images may not be grotesque, but they are certainly critical. 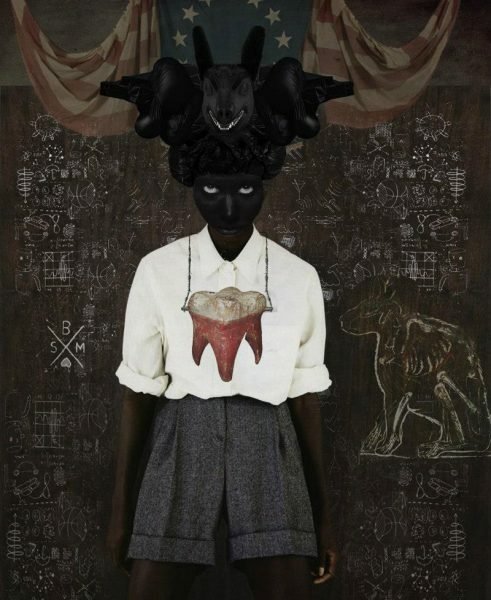 One of his works, entitled Tooth Fairy, depicts a young black woman with her head lowered, whose eyes pierce the spectator in a frightening and even threatening way. The collage literally references the tooth fairy, which is why there is an extracted molar on her shirt, still covered in blood. However, the image is not only frightening because of the strange way in which the woman embodies the sweet childhood character, but also because of her powerful historical and political background. The girl is one of the daughters of the United States occupation of Haiti, which occurred between 1915 and 1934. A state of repression that generated an ultimately unsuccessful resistance movement of Haitian rebels called “cacos”. After American intervention, which was completely self-serving, but operated under the pretext of pacifying Haiti because of its political instability, the Caribbean nation remained a slave to governmental chaos, getting poorer and poorer in all aspects. Hence, the United States’ flag located in the top part of the composition. But this is not an ordinary US flag: it is the one popularly attributed to Betsy Ross, with the thirteen colonies as stars. In this way, the artist also alludes to the legendary and even whimsical character of the nation, avoiding a face-to-face encounter with the actual American flag. The woman is surrounded by symbols on a blackboard, which are linked to voodoo, that is to say, a manifestation of the awful rage felt by the Haitians over the country’s precarious situation during and after US occupation. However, although structurally these symbols resemble those of the Haitian religion, in fact they are profane motifs like robots, wind-up cars, basketball balls or umbrellas. They can seem reminiscent of Stivenson Magloire, but the iconography is totally alien to voodoo. Similarly, there is a hare in the painting, which is also drawn in the outer walls of the Bradford Odeon cinema in the United Kingdom. This animal has been associated with necromancy. There is a certain irony in the fact that the artist works with elements that represent both countries, which also softens the message and makes it more complex. Graffiti is directly linked to the taste for pop surrealist art. 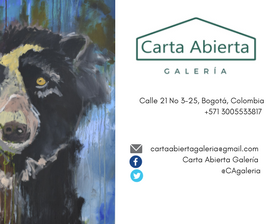 He also employs artistic elements that are not within traditional art history. The introduction of voodoo might also suggest that the young woman is possessed, given the look on her face. The creature on her head is a dog, which is also linked to a character of Haitian Voodoo, Papa Legba. Its diabolical appearance highlights the message’s power. Skaletsky is not only interested in historial political facts, but also in current politics. Tramp Therapy is a work starred by the President of United States, Donald Trump (2017-), in which he appears in the centre of the composition, bidding farewell to the viewer. His face is actually a mask: his eye sockets are empty. The title itself refers to falsity: it’s a play on the words Trump, tramp and trap. The piece denounces the fact he made promises during his presidential campaign and has later been broken them during his presidency. 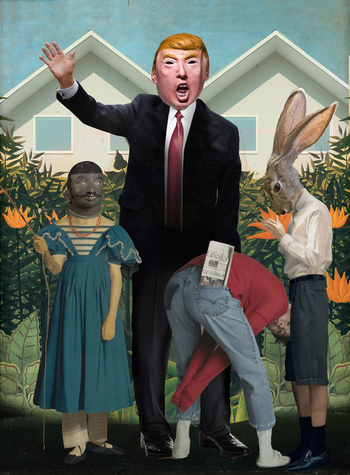 Set in a traditional urban American scene and adorned with the same vegetation in Henri Rousseau’s piece, Tropical Landscape: an American Indian Struggling with a Gorilla, Trump exercises his power over the characters that surround him. The girl to the left of the collage is Mary, also portrayed by the English painter, Robert Burnard, but her face also is a mask, an initiation mask. Belonging to Tanzanian Makonde culture, the mask could possibly represent the States’ ethnic diversity, which has not prevented (rather encouraged) the actions of the xenophobic president. The boy of the center is Asian, supporting this theory. To the right, there is a therianthropic boy with a rabbit head, praying, reminding the president about religion. Nevertheless, not all of the Russian artist’s collages have to do with the pop universe. A large portion of his artistic production is dedicated to neo-surrealism themes such as in Fighter, which depicts a young militant woman advancing through the woods of Botticelli’s Primavera. The female warrior is carrying a spear, but the image seems absurd. It’s an unreal situation, because the modern woman couldn’t fight as medieval warrior did. Devoid of any sort of armor, her clothing is, without any doubts, contemporary. She seems to be relaxed and even despondent in her slow walk, so the piece transmits the decay that any struggle implies, whether it is physical or emotional. The artist imitates compositions of art history as well, to reinterpret them iconographically, as it is the case of Lady with an Ermine, also Leonardo da Vinci’s eponymous work. 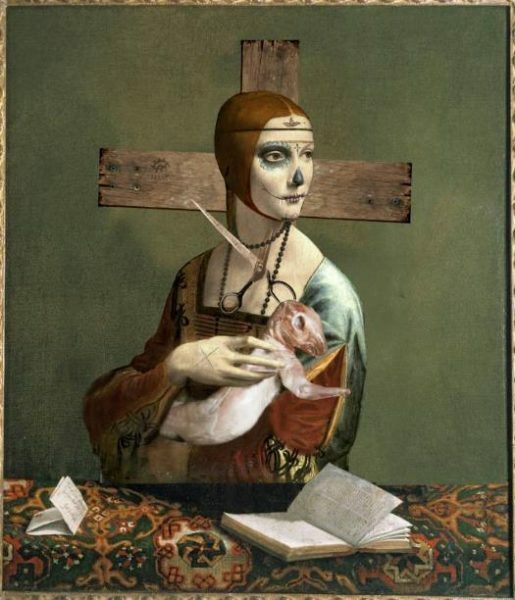 Skaletsky’s lady with an ermine is not holding a mustelid, but a skinned lamb, explicitly alluding to the Passion of Christ and the Lamb of God in Christianity. In addition, the lady references the religion due to the cross that she bears on her back. The ermine of the leonardesque painting also has an allegorical character, so the Russian artist respects the iconography of the artistic works which he decides to use. The paint on the lady’s face also catches the eye, since it is usually employed to decorate the popular skulls of Mexico’s Día de los Muertos. In this way, the artist presents two different visions of death and its celebration, which also symbolize resurrection and cultural syncretism.